We’d love your help. Let us know what’s wrong with this preview of What's New? The Zoo! by Kathleen Krull. * The first zoo was established forty-three hundred years ago in what is now Iraq? * Aztec King Moctezuma II had such an incredible collection of animals that it took six hundred men and women to care for them? * Children across Great Britain wrote to Queen Victoria when Jumbo the elephant was sold away from the London Zoo? * Fifty buffalo passed through Gra Did you know . . .
* Fifty buffalo passed through Grand Central Station in 1907 on their way to the Bronx Zoo? * Zoos now play a crucial role in animal conservation? Kathleen Krull and Marcellus Hall bring witty insight, jazzy style, and a globe-trotting eye to our millennia-long history of keeping animals -- and the ways animals have changed us in turn. To ask other readers questions about What's New? The Zoo!, please sign up. Be the first to ask a question about What's New? The Zoo! Did you know that the first "zoo" was first introduced over 4,000 years ago by the Sumerian King roaring at lions? Did you know that the Ancient Chinese had a "zoo" called the Garden of Intelligence? Did you know that Aristotle was the first person to WRITE a book on the subject "History of Animals"? Did you know Alexander the Great's own zoo had 96 Elephants? Did you know the largest zoo in History was actually in Mexico with over 600 Staff and nurses to take care of the animals? Did you know I Did you know that the first "zoo" was first introduced over 4,000 years ago by the Sumerian King roaring at lions? Did you know In 1735, Swedish Scientist, Carl Linnaeus, classified animals in "System of Nature", which established a new branch of Science, ZOOLOGY? Did you know that the first public Zoo didn't exist in London until 1835? Did you know that there are specialty zoo's, famous animal sanctuaries, and amazing Animal labs in countries all over the world? Brief descriptions of different zoos throughout history. Does not go into the morality of zoos, but it is aimed at like, 8 year olds so I guess that’s to be expected. Still interesting to see how zoos have evolved (or not) over the centuries. While l found the information interesting, I think some maps and timelines would have helped kids put it together. As it is, the information seems a bit random. This is a fun informational book for grades 3-4. I didn’t realize that zoos came in all different shapes and sizes. Zoos date back to a very long time and this book notes how they have grown and changed over the years. I like how this book ends by stating all of the different purposes of a zoo and encouraging kids to visit a zoo. This is a non-fiction/picture book. It has a nicely laid out history of the zoo across time and the whole world. Pictures are watercolor and pretty good. Great information. I would buy for my library. Highly recommended for grades 3-5. Interesting text paired with eye-catching illustrations. A new favorite! This is a great informative read about the history of zoos. This book would be great for an upper elementary classroom. But I even found myself getting a little bored with some of the information. I think this book could be best utilized in a research project about zoos or something along those lines. Visiting the zoo is a favorite for preschool and elementary field trips. Before your next trip to the zoo, check out Kathleen Krull’s newest, What’s New? The Zoo! : A Zippy History of Zoos. In it, she explains how zoos have changed in purpose and design, from the first known zoo about 4400 years ago in Ur (present-day Iraq) to the 2009 birth of a rare panda at the San Diego Zoo. The earliest known zoos were private ones belonging to kings, queens, emperors, and other very important men. Often the Visiting the zoo is a favorite for preschool and elementary field trips. Before your next trip to the zoo, check out Kathleen Krull’s newest, What’s New? The Zoo! : A Zippy History of Zoos. In it, she explains how zoos have changed in purpose and design, from the first known zoo about 4400 years ago in Ur (present-day Iraq) to the 2009 birth of a rare panda at the San Diego Zoo. The earliest known zoos were private ones belonging to kings, queens, emperors, and other very important men. Often their purpose was to show others how rich and powerful the zoo owners were. Eventually, curious people either began their own private zoos or visited the royal zoos in order to study animals. The first zoo that was open to the public was in London in 1846, where people wanted to escape the smoke and dirty buildings of the city and get back to nature. In 1875, a zoo in India became the first to breed white tigers and other animals that were becoming hard to find. And the mission of many of today’s zoos is to protect endangered animals and re-introduce them back to the wild. The design of zoos has changed, too. In 1907, a zoo near Hamburg, Germany, became the first public zoo without cages, using moats, trees, hedges, and artificial rocks to separate the residents from the guests. By 1978, visitors to Seattle’s Woodland Park Zoo were complaining that the habitats had so many plants and trees that they couldn’t see the animals. In addition to these “firsts,” Krull provides lots of fun and fascinating peeks at zoos in the past. One of my favorites is about Jumbo the elephant, who was such a favorite of England’s children that, when P.T. Barnum bought the pachyderm for his new circus in America, a hundred thousand children wrote letters to the queen, begging her to stop the sale. What’s New? The Zoo! will be an excellent choice for the science curriculum, as well as a great book for kids who just like animals. This illustrated historical overview of zoos takes readers from 2,400 BC, in the Sumerian city of Ur, to present-day San Diego, California. It discusses the many different types of animals that were kept, as well as how they were kept, studied, and enjoyed, in a host of civilizations throughout the millennia. This is a great book for tweens interested in animals, and how humans became their caretakers in different ways and different time periods. The biggest drawback of this book—from a tween pe This illustrated historical overview of zoos takes readers from 2,400 BC, in the Sumerian city of Ur, to present-day San Diego, California. It discusses the many different types of animals that were kept, as well as how they were kept, studied, and enjoyed, in a host of civilizations throughout the millennia. This is a great book for tweens interested in animals, and how humans became their caretakers in different ways and different time periods. The biggest drawback of this book—from a tween perspective—is that the beautiful illustrations are somewhat childish, and may dissuade tweens from picking up the book, for fear that they might be seen reading a “baby” book. The cute giraffe and smiling children speaking the title to one another in cartoony speech bubbles on the front of the book makes it look as though it is geared toward a much younger audience, though it is tweens—and perhaps even teenagers—who will appreciate the facts, as they will have some understanding of the civilizations discussed in the book, while younger children will not. This would be a great book to accompany a zoological science or animal discovery program geared toward tweens. In the context of a science program, they might be more willing to give the book a try. It would also be great to supplement a unit of any of the civilizations addressed in the book, or to feature on a “Fun Facts” display, though—again—the cover art may make it unappealing to tweens. With friendly facts, funny pictures, and animals galore, WHAT'S NEW? THE ZOO! is history to roar for! * The first zoo was established forty-three hundred years ago in present-day Iraq? * Zoos were crucial in the development of scientific theories of classification and evolution? I definitely gave this book a 5 star rating! This nonfiction text left me disappointed. I thought it was a bit text heavy and would benefit from some chunking. What If You Had Animal Teeth!? does a much better job with nonfiction layout for younger readers -- text about the animal, a blurb about teeth adaptations, and then a bit about what it would be like for a person to have those teeth. A similar layout or organization would serve this text well. I'm not particularly anit-zoo but I think we can all agree that zoos can be crappy places f This nonfiction text left me disappointed. I thought it was a bit text heavy and would benefit from some chunking. What If You Had Animal Teeth!? does a much better job with nonfiction layout for younger readers -- text about the animal, a blurb about teeth adaptations, and then a bit about what it would be like for a person to have those teeth. A similar layout or organization would serve this text well. Who doesn’t love the zoo? Well, did you know that zoos have been around for thousands of years? In fact, the first recorded zoo began 4,400 years ago in the city of Ur. You can read all about it in What’s New? The Zoo! A Zippy History of Zoos. But that’s not all you’ll find out about. You will also learn about how the Greeks began running zoos in order to learn from animals and how an elephant sprayed holy water on Pope Leo X in 1513 in Rome, Italy. About a giraffe that inspired a brand-new hair Who doesn’t love the zoo? Well, did you know that zoos have been around for thousands of years? In fact, the first recorded zoo began 4,400 years ago in the city of Ur. You can read all about it in What’s New? The Zoo! A Zippy History of Zoos. But that’s not all you’ll find out about. You will also learn about how the Greeks began running zoos in order to learn from animals and how an elephant sprayed holy water on Pope Leo X in 1513 in Rome, Italy. About a giraffe that inspired a brand-new hairdo in 1827 Paris, France and how the United States National Zoo was the first one to begin protecting endangered species in 1889. You’ll read about the first zoo to stop keeping animals in cages and how zoos were used as an escape from the hustle and bustle of the big city. All this and so much more can be learned when you read What’s New? The Zoo! A Zippy History of Zoos. So pick up this book and learn more about the incredible history of zoos! The thing that I found most interesting about this book was the changes in why zoos have existed throughout the centuries. The follow up resources were also very good. What I didn't like this book? The anthropomorphism of the animals and portraying them as though they were happy and unstressed in a zoo setting. Let's face it (and we have seen it)...give animals the chance to escape their enclosures and they are jumping on it! They are not all walking together in a parade nor saying goodbye to zoo The thing that I found most interesting about this book was the changes in why zoos have existed throughout the centuries. The follow up resources were also very good. Kathleen Krull presents a history of zoos over the past five hundred years to the present. The author presents a history of zoos over the past five hundred years. Each two page spread contains a short, informative narrative of the location of the zoo, the founder, and a curiosity indigenous to that particular zoo. Soft watercolor illustrations are humorous and the expressions of the characters are delightful. 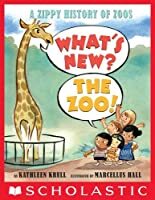 The young reader will enjoy poring over the pages and then clamoring for a trip to their Kathleen Krull presents a history of zoos over the past five hundred years to the present. This brief history of zoos does a great job of describing the changing motivations different cultures have had for building and maintaining zoos. I really liked how the ending reviewed the many reasons why zoos were formed throughout time and space. A source list rounds out the back matter. Ink and watercolor illustrations prove to be just the right medium to use to shine a spotlight on the many creatures found within text and to highlight some of the zaniness of historical peoples. This book disappointed me a little! I like the idea of tracing the history of a particular topic, but the short bursts of text didn't seem too related. In fact, some of the history was really more about the history of rich and powerful people owning animals, and not all of the stories were that compelling. This could have been a lot more. Still, it's not a bad non-fiction text to have in the classroom. A good look at the history of zoos. It was in narrative format so I think it would make a good read aloud to students. It would make a great stepping off point for students who were doing research on zoos. I would have preferred a less cartoon look to the illustrations. I think kids would receive it better if the illustrations were different. Such a fun book about the history of zoos! I always thought zoos were a relatively new phenomenon but I sure was wrong! We humans have been keeping exotic animals for entertainment and pleasure for thousands of years. It's neat to see how zoos have changed (or not) over the many years. Interesting overview of 5 or 6000 years of zoos. Lively, often humorous text relates reasons why leaders or cities started zoos. The fluid, watery ink and watercolor illustrations often reflect the humor and are uniformly lovely but I would've preferred less cartoonish, more realistic illustrations. shared seemed a little random in their placing in the text. This "zippy history of zoos" was a brief, yet interesting look at zoos dating back 4400 years ago through today. Zoos on all continents (except for Antarctica) were represented. 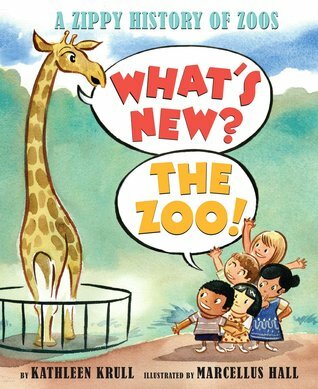 This would be a fun book for teachers to share before a field trip to the zoo. A quick tour of zoos through the centuries and throughout the world. Entertaining and appealing but the text would benefit from less cartoonish illustrations. Some mention of zoos being controversial among some people would make for a more well-rounded presentation. A very nice overview, and very informative for as short a book as it is. Interesting look at the history of zoos. Beautiful illustrations! Interesting history of the evolution of zoos, lots of fun tidbits, but too lengthy.